With over fifty poems, this book from Britain's favourite poet, You Made Me Late Again! is an essential addition to Pam Ayres' incomparable collection of works. Pam's poems are observant, witty and poignant in equal measure. In 'The Swifts' and 'The Pyracantha Anthem' she marvels at nature, while 'A Patient's Prayer' and 'Litter Moron' offer wry views on Modern Britain. From the dog being afraid of the toaster to your son leaving home for university; and from the search for that perfect swimsuit to becoming a gran for the first time - Pam's poems are beautifully crafted, and her subjects the everyday and the universal. Delightfully illustrated, most of the poems in You Made Me Late Again! are brand new, yet it also features several firm favourites from her stage shows, published for the first time, such as 'The Make-up Lady' and 'Tippy Tappy Feet'. Pam Ayres has long-reigned as perhaps Britain’s best-loved poet. 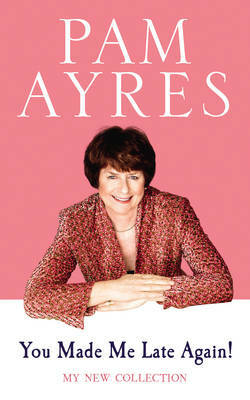 Ayres' deceptively simple approach has seen her verse tackle life in all its pathos and glory. Pam Ayres - The Works compiles the key poetry that helped establish her name.